No long forms, complete in seconds. Pay fortnightly with interest free! 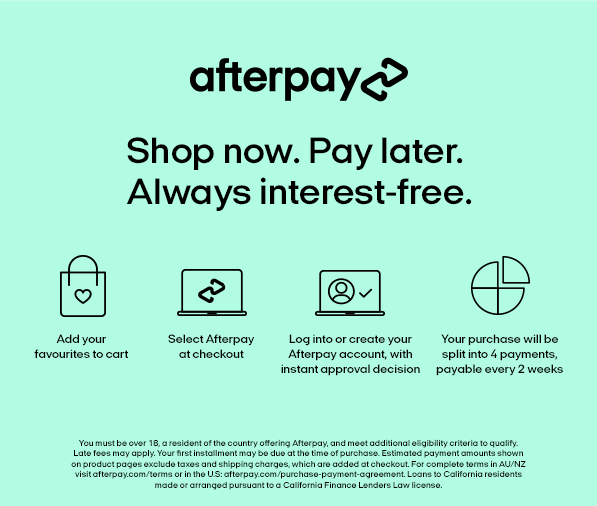 Afterpay is a payment service which gives you a flexible and simple payment solution when shopping online at Mamaway. Designed to suit you, Aterpay allows you to purchase what you want now and pay it off over 4 fortnightly installments. Your order gets shipped straight away just like a standard order and there's no interest or delays. New customers will be charged their first payment at the time of purchase, Afterpay will automatically debit the next instalment from your account every fortnightly. Once you have completed your first full payment cycle with Afterpay, the initial payment for any future purchases will be debited 14 days after the transaction. However, If you fail to make a payment in accordance with Afterpay payment schedule, late payment fees will apply. In addition, because an Afterpay account is linked to your credit or debit card, standard card fees and charges may be applicable. You should refer to your card issuer's terms and conditions for full details of these. Yes, there is a limit of maximum $800 for every Afterpay transaction. Afterpay is only available on items marked with the Afterpay logo, and it is not available on gift cards purchase. Afterpay orders are delivered as per our standard delivery policy after you complete your online order. How do I return the items purchased with Afterpay? You can return your Afterpay purchase using our standard online return policy. Once we have received your items we will notify Afterpay and any further payments will be canceled. If you have already made one or more payments, the total amount paid will be refunded to the credit/debit card that you used to place the order. Afterpay will communicate these payment changes to you via email. Please note customers are responsible for the cost/postage for all returns with the exception of faulty items. If you wish to exchange for style or size, you must return the items and place a new order. What if I have an issue with my Afterpay account? You will need to contact Afterpay directly in relation to issues with your Afterpay account. For more information, please visit Afterpay Q&A page here.